Unfortunately, a watch winder is very expensive, a single watch watch winder can cost you no less than US$ 30, a twin watch watch winder cost you no less than US$40. Although most manufacturers of the watch winders claim that their products are professional, high quality, special designed for the automatic watch, there is no lab test report on their web sites or the Internet. A good motor, it should be quiet and robust because a watch winder may be running whole night, whole week, whole year long although there are rest time for the watches and the watch winder. A good motor, it should be small; therefore the motor can be placed far from the watches in a small space. This is critical because the motor is the main source of magnetism which harms your watches. Magnetic Shield, the best way to protect your watches from magnetism is wrapping your watches by the magnetic shielding materials; however, these materials are not cheap, so many manufacturers only use the "soft iron" to confine the motors. Therefore, ask for "opening / disassembling" the case of the watch winder before buying an expensive watch winder. On the other hand, we confirmed that a watch winder can be made at home with zero magnetism ! In our DIY Watch Winder Project, we try to use as little money as possible, we would like to change the "rubbish" to the useful watch winder. Our target is to make a watch winder which is zero magnetism inside the watch cage and can really wind a automatic watch. 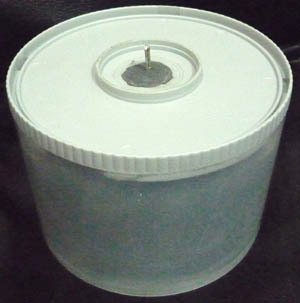 After searching and thinking for about 1 week, we decided to use the CD-R container to construct the watch winder. One CD-R container is for holding the watches, another one is the motor room. 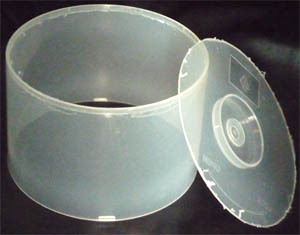 We cut the lid of one of the CD-R containers as the photo shows. An axle is needed, the diameter depends on the size of the universal joint mentioned later. When we chose the material as the axle, we tested it with the compass. If the compass rotates when you put the material near the compass, the material is magnetized - Do not use. Before going ahead, we have to buy some parts !